The journey to 100 has been a lot of fun. 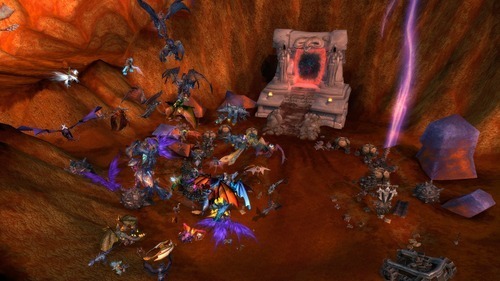 I was incredibly fortunate and didn’t experience any of the queues or other such issues (although many of my guild friends did). To be fair, some mornings I was up at 5:30am so I think that definitely helped. So! Here are a bunch of us all waiting by the portal to go through to new adventures in savage lands. General chat was immature as ever, but turned to excited squeals when the portal opened 15 minutes later. 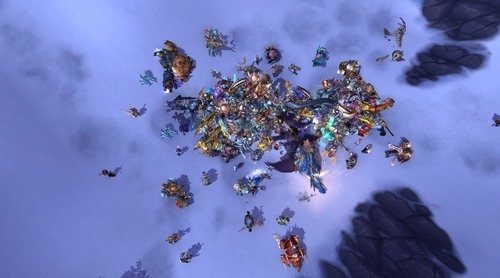 They shortly turned to “I can’t find Khadgar – can anyone see Khadgar? WHERE IS KHADGAR?!? !” and “laaaaaaaaaaaaaaaaaaaggggggg” and later “this game f**kin’ sux” (aren’t people delightful?) And then the server crashed. When we got back literally 2 minutes later, things were fine (lagging, but fine) and Cinderstorm made her way through the Dark Portal to Draenor. The opening quests in Tanaan Jungle were pretty awesome, but took a good 2 hours to get through because of the sheer number of people trying to click/kill the same stuff, and didn’t really provide opportunity for screen shots. Eventually we arrive in Frostfire Ridge to start building our garrison… and then everything kind of fell apart. The lag was quite intense, making it very difficult to do anything. In addition, people being people, it was incredibly difficult to click on certain things due to the rudeness of others. Killing things proved difficult, too, as each person needed their own tag. Eventually I decided that it wasn’t worth the frustration, so logged over and sent my warlock and mage through the starting zone. By then a lot of the lag passed and I was set to make my garrison. i really enjoyed levelling in this expansion. There were subtle things that made it so much more engaging. For example, the quest givers would be in one spot to give you your quest. You’d then trek off on your adventure to save the day. Instead of having to go back to where you got the quest, though, the quest giver has come to you, or gone a little past you, making it feel like they’re part of your adventure, too. 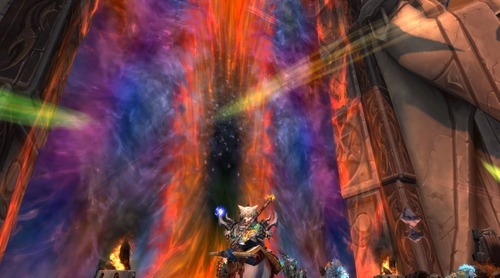 I felt it really helped to move the questing along, and made it a more immersive experience. It took me a few days to get to level 100. Not because of any issues, but because the place was so darn beautiful that I kept stopping to take screen shots!! And then there were all the rares and the toys and the new pets. Oh it was just so much and so exciting! I ended up skipping over Spires of Arak towards the end because I was so tired from the early starts and late finishes, and I wanted to see the end cinematic in Nagrand (those of you who have seen it will know what I’m on about!) It was worth it. 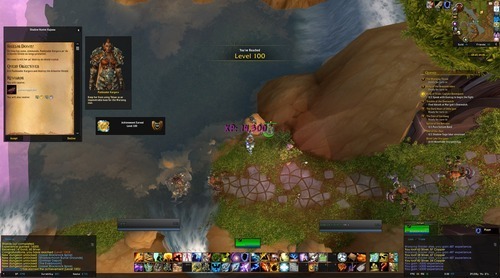 So now that I’m 100 I’ve been working on my garrison and freaking out over how terrible my poor elemental shaman is (she’s gets smashed by level 92s!!!) Thankfully I’ll be healing, and I’m slowly getting better at that, so I think everything should be ok.